By now you know the basics of Redbooth as an online collaboration tool, how to set up projects and tasks and you’re even comfortable enough to hit CTRL+Enter (or Command+Enter if on Mac) to send your messages. 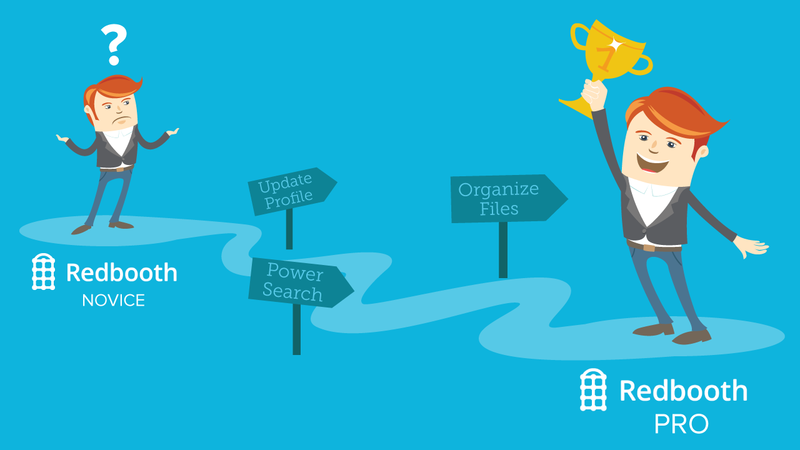 After you’ve integrated your cloud storage (Dropbox, Google Drive, Box or Copy), what’s next? Your co-workers and fellow project members might need to get in touch with you outside of Redbooth. Make collaborating easy for them by adding a profile picture, filling in your profile with your email address, work number, and a link to your LinkedIn profile. When someone on your virtual team clicks on the icon that represents you, they can find your contact information. Can’t find a file but you know it was in there somewhere? Put the productivity in your productivity software to the test and just check the files tab of the project. Everything will be listed in alphabetical order, but you can also have things listed by newest and oldest additions to the project. For the super-organized, here you can also sort all the files into folders so everyone on your virtual team knows exactly which file has to do with what. This is particularly useful if you have multiple task lists and would like the files to correspond to each of them. Best of all, the files section can be used as a repository too. By clicking “Add files” you can add them directly to Redbooth instead of having to peruse through Dropbox, Google Drive or any other cloud storage service you may be using. This is especially useful for users of On-Premise. File them away into folders and every project team member will have access to all the necessary information. Looking for something or someone specific? You can always filter your search results so that your results are relevant and easy to understand. When searching, or looking at reports and tasks, you can always filter by user, project or click on tags to see tasks with that tag across multiple projects (ex: #Q1). This way it’s so easy to see who is assigned to certain projects, what is due for Q1, or how much time was spent within a specific project. Has your conversation turned into an actionable item? Keep the thread going and turn it into a task. All you need to do is go into the conversation, and in the task menu click “Convert to Task.” It’s simple, and you retain all of the information that started the thread! Need to know everything that’s going on? Don’t want to know anything about projects except for what you’re assigned? Set up your personalized combination in the settings bar. To get there, click on your icon and go to “Settings.” From there under “Notifications” you’ll find an “Auto-Follow” option. This is where you get to pick and choose what arrives in your notifications dashboard. At this point, you can either choose not to follow anything, follow some projects (or even specific aspects of projects) or automatically follow everything. This way you’ll always be notified of changes, updates and new information on important items. Even though you’ve integrated Redbooth with the usual subjects, depending on your needs, we’ve got you covered. No matter what you want to do, Redbooth is compatible with all kinds of online collaboration tools so you can track your bugs, streamline the design process, link directly to your notes (in all sorts of programs), and even get that document signed faster. So what are your favorite Redbooth tips and tricks? What are your favorite Redbooth tips and tricks? Let us know in the comments. How do you maximize your efficiency with Redbooth? Let us know!